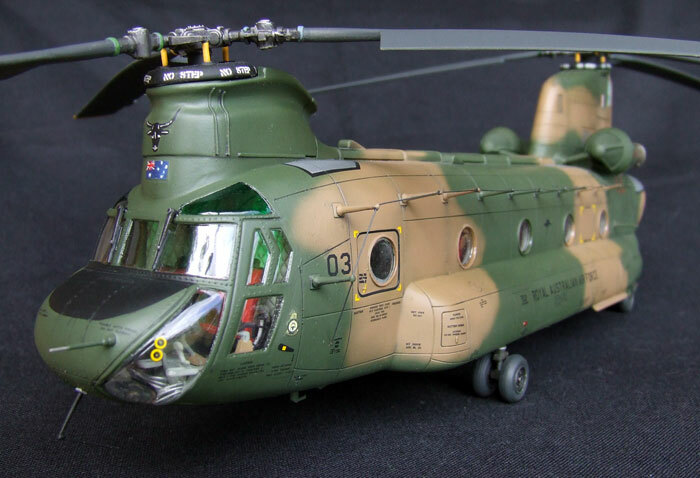 I built this Aussie Chook using Italeri's 1/48 scale HC.1 Chinook kit. 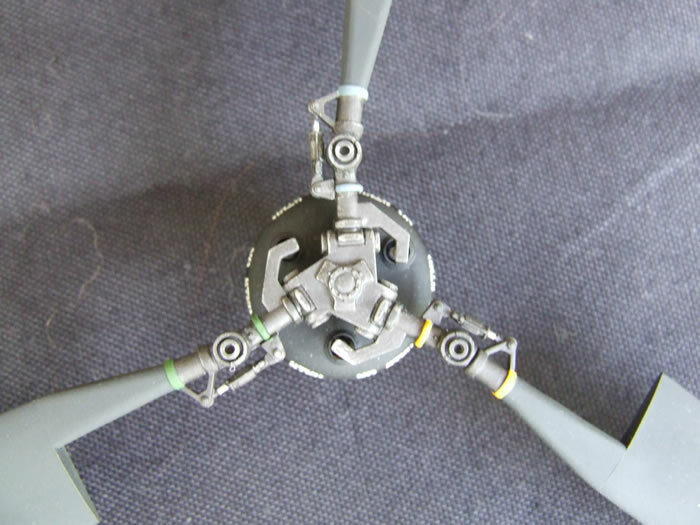 The kit was built according to the instructions with a few improvements and corrections. Following along with the instructions, I will outline the changes made. 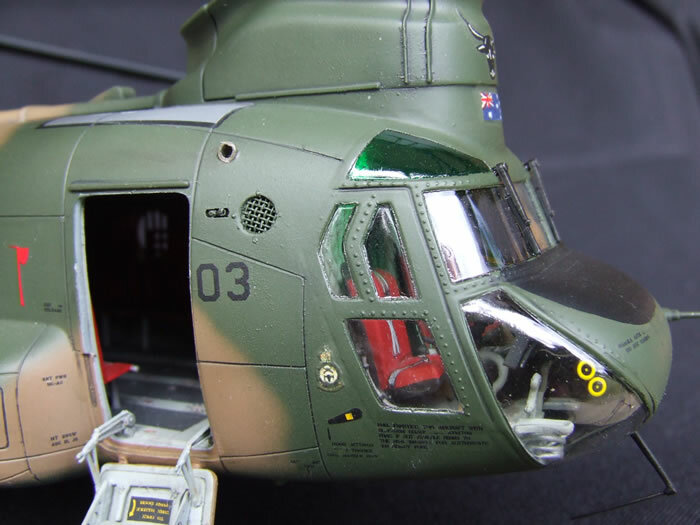 The cockpit and cargo deck were built as per the instructions. 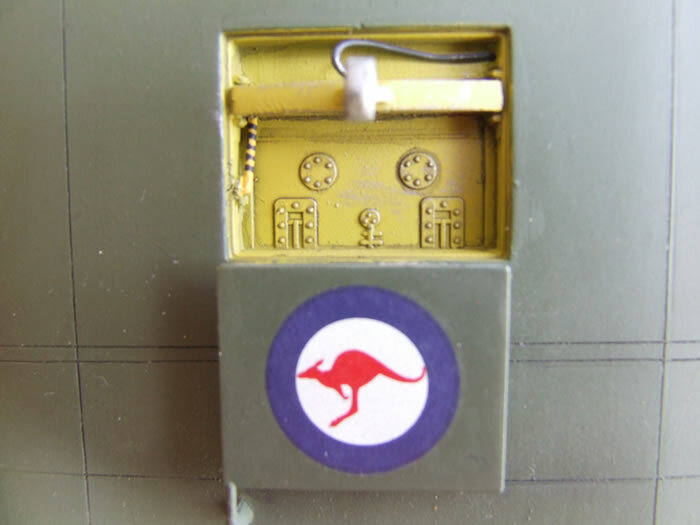 The only additions were the hydraulic lines to the foot well area; and some detail to the rear of the instrument panel in the form of instrument backs and wiring made from plastic card and wire. 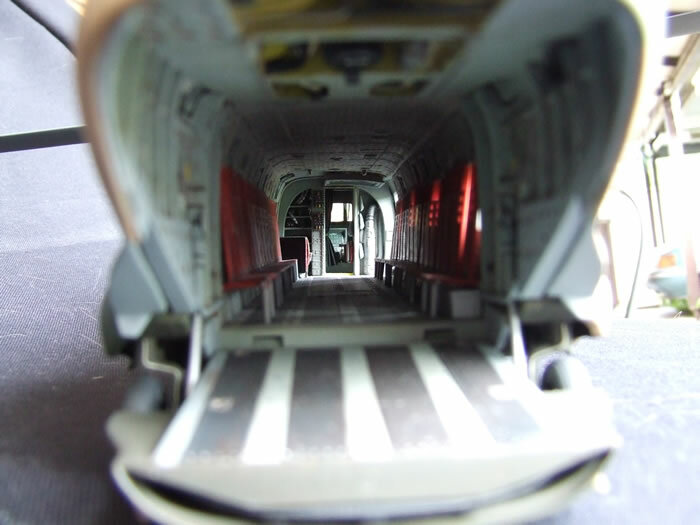 The tunnel between the cockpit and cargo area had a fold down jump seat made and added along with a blackout curtain which was made of paper and wire. 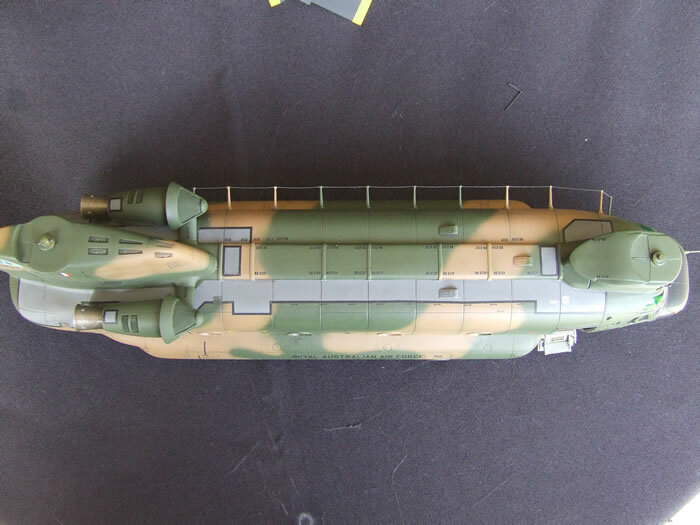 I also added the prominent stowage bags to this area and the avionics area using, of all things, 1/35 German bread bags. Hey, if it looks right go for it. In the avionics area I also added wiring to the avionics shelving. The next area to get some attention was the three Hell Holes at the rear roof of the cargo area. 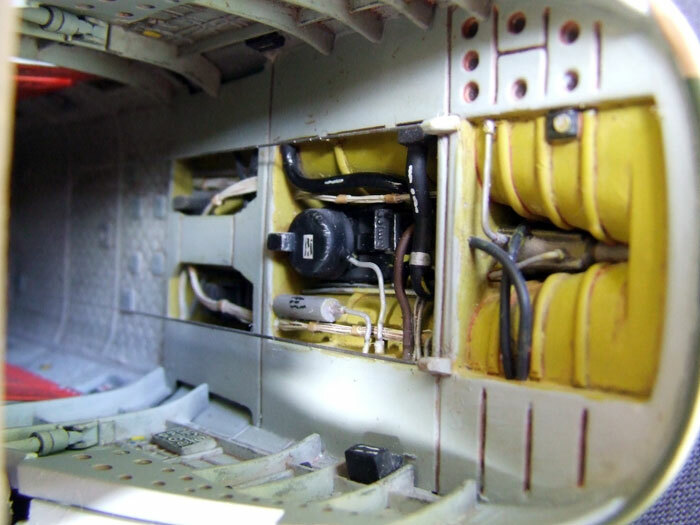 This area on the real aircraft is a very busy area so, armed with photos of this area, an approximation of the equipment found in this area was made using parts from my spares box. 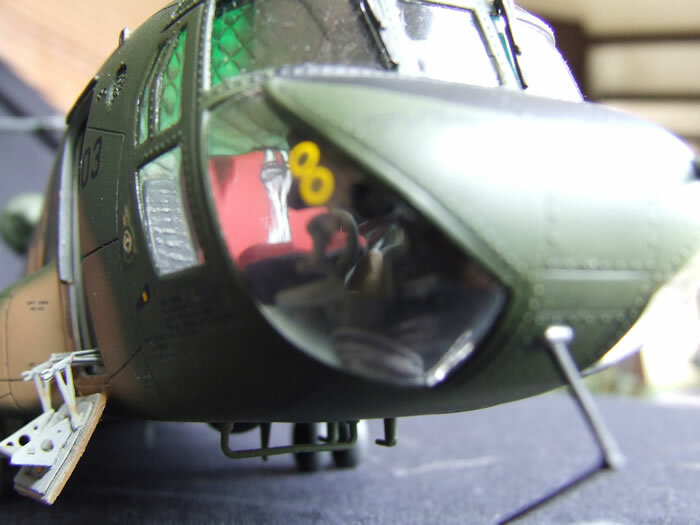 Wire of different sizes and solder were used, plus parts from a 1/35 M113 APC engine. Half round plastic rod was used to make the prominent structural ribs. The APU in the rearmost Hell Hole was constructed using the base of a hypodermic needle a cotton bud and various bits of wire. 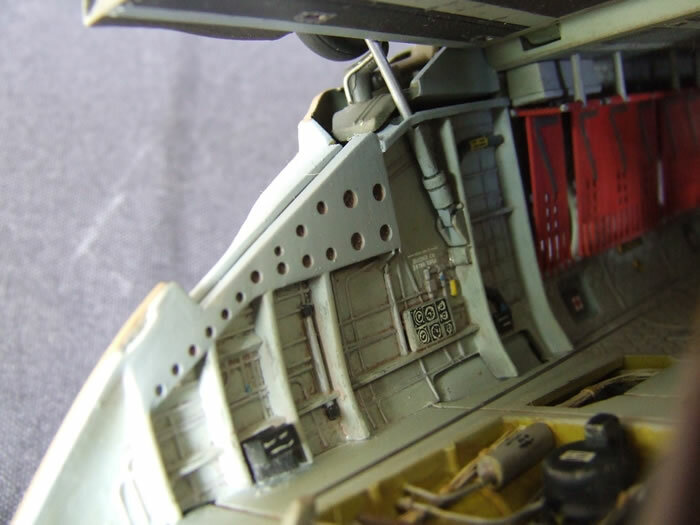 The interior was then painted using Tamiya enamels and final assembly was carried out thus completing the interior. Assembly continued with the removal of all the vent screens and adding of mesh screens which I feel adds greatly to these areas. 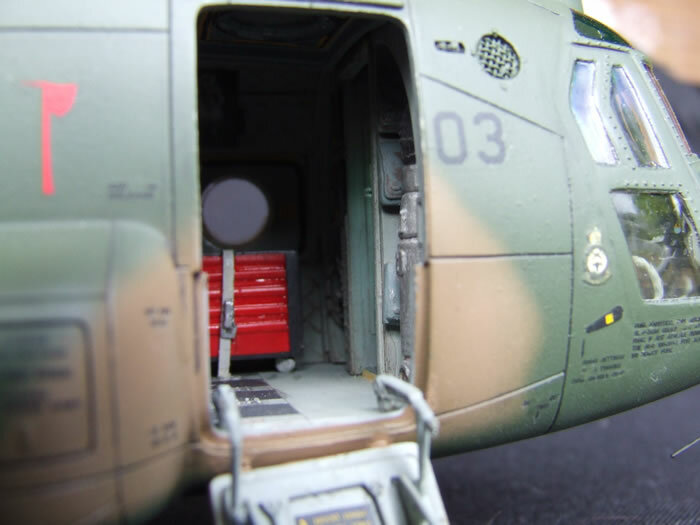 The only other modifications to the exterior were the hydraulic connection point at the top right hand side of the crew access door and the APU exhaust's at the front right hand door and rear rotor mast. 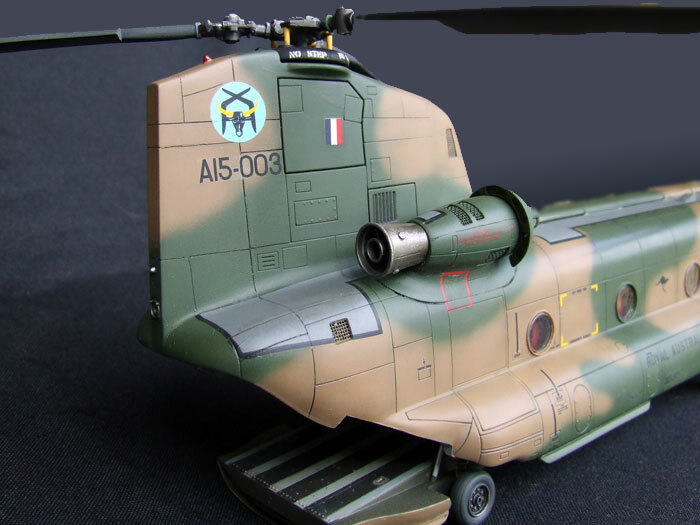 The painting stage followed when all construction was complete again using Tamiya enamels. The colours used were Dark Tan and JA Green. Both of these were lightened with Desert Tan until they looked right. When the basic colour scheme was done the panel lines had a very light wash sprayed over them followed by a coat of gloss to help with the following steps. 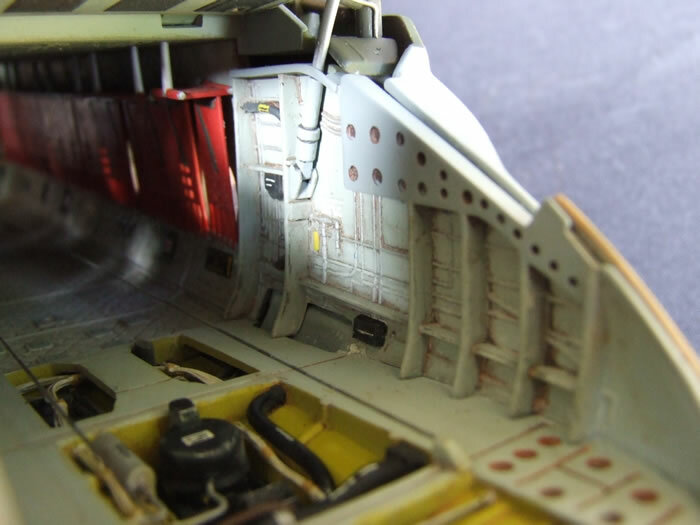 Once this had dried a wash of German Grey acrylic was flowed into the panel lines. Decals were then applied. These included the replacement of the Roos as it seems that Italeri's look more like paddy melons than Kangaroos. 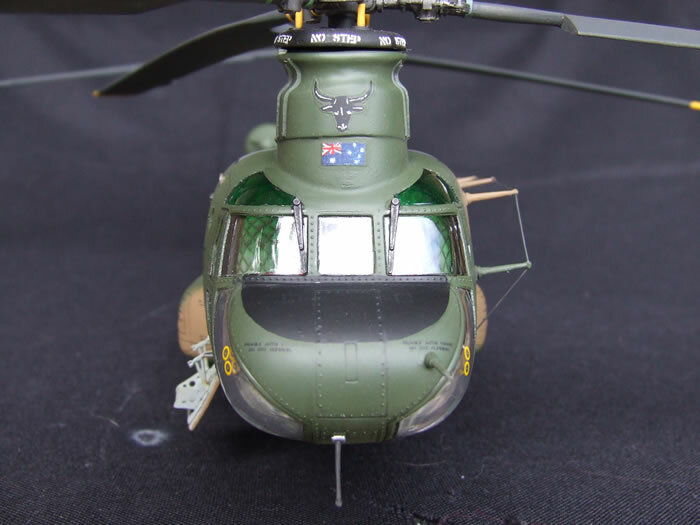 I also hand painted the bull’s head on the front mast and created the Australian flag and 12 sqdn crests behind the cockpit decals. The kit decals worked well with only minor silvering. 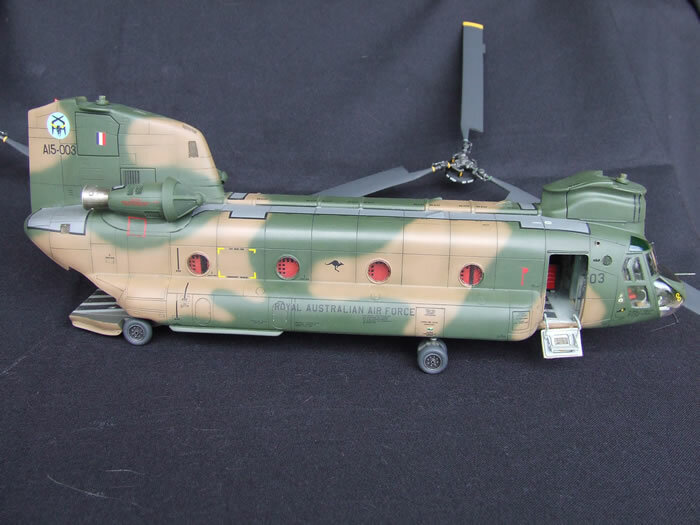 The final additions were a tool chest made of plastic card strapped down in the forward cargo area and a centrefold. The final coat of matt varnish finished off the build. I thoroughly enjoyed this kit and in my opinion is a very well done representation of the Chook. And before you crucify me for not having the correct intake screens for an Aussie Chook, I know they are wrong but after 20 something attempts to make correct ones I gave up and settled for the kit screens until I can make the correct ones or some one makes a correct replacement. I hope that you enjoy these photos and that they may help someone.